After stealing a point in Dallas, the Whitecaps return home and will look to finally get back to winning ways this weekend. They won’t be able to rely on many more own goals or 100th minute penalties going forward, so the ‘Caps will have to start playing much better if they are to hold onto a playoff place. Tuesday’s training session brought some good news on the injury front, as Jordon Mutch is close to returning to action. He did not participate in the full training session, but Carl Robinson said he might end up being fit enough to be involved on Saturday. Unfortunately, the situation is not the same for Stefan Marinović, who is still out indefinitely with a knee injury. This means Brian Rowe will continue to start in goal, while residency graduate Sean Melvin has assumed backup duty. Rowe’s unspectacular play means there is a slight chance we could see the 23-year-old Victoria native, but Melvin more than likely won’t feature in a game until the Canadian Championship in July. This weekend’s match will also be Kendall Waston’s last game before he links up with the Costa Rica squad ahead of the World Cup. 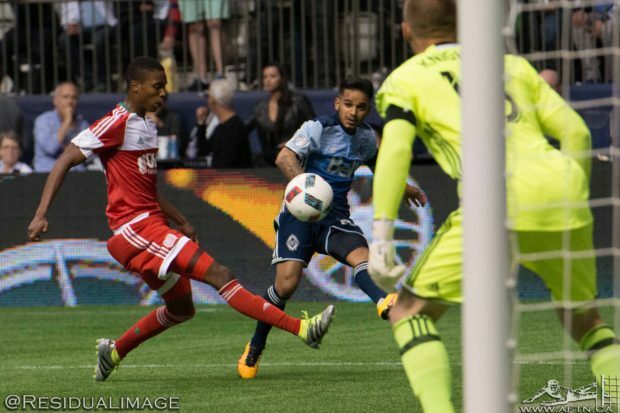 Waston is guaranteed to miss three Whitecaps matches, and could be gone for as many as six if the Ticos can rekindle the magic they had in 2014. The big man’s absence will give Aaron Maund the opportunity to slide back into the starting line-up, while Doneil Henry will be recalled from his loan to Ottawa and will likely be given a shot as well. The Canadian has started three games for the Fury, and they have kept a clean sheet in all three. The question of who starts at fullback continues to be up in the air from game-to-game, and might remain that way for a while. The veteran duo of Marcel de Jong and Sean Franklin seem to have the upper hand at the moment, though Brett Levis and Jake Nerwinski both started against Dallas. For Levis, it was his third start of the season as he continues to push past the devastating ACL injury that cost him nearly all of 2017, while it was Nerwinski’s first action after over a month on the bench. In the midfield, Felipe has started to hit his stride and has managed to rack up a team-leading five assists. Russell Teibert put in another strong shift beside him against Dallas, recording a game-high 55 passes and 93% passing accuracy. It will be interesting to see who Robinson elects to start out of Felipe, Teibert, Aly Ghazal, and Efraín Juárez: Ghazal did not feature in either of the last two matches after recording four straight starts, while Juarez started the match against San Jose, his first since he was sent off against Kansas City last month. Up front, Yordy Reyna looks like he has begun to rediscover the form he had last year. He finally got on the score sheet with a goal and an assist against San Jose, and then put in his best road performance of the season against Dallas. The duo of Reyna and team-leading scorer Kei Kamara has the potential to be a strong one, assuming the Peruvian can continue to grow into the season. On the wings, it is a safe bet that Alphonso Davies and Brek Shea will be involved at some stage, as they are the two Whitecaps who have appeared in every game so far this season. Davies has continued to drive the attack whenever he’s on the field; his incredible pace and evolving skill always posing difficulties for the opposition. Shea – though he started last weekend – usually plays the role of the super-sub, and is usually good for at least one chance when he’s brought on (whether he finishes it or not, that’s another story). Given that the ‘Caps will be at home we will likely see Cristian Techera on Saturday, as Bernie Ibini has not really done enough to warrant another start. On the side of the visitors, New England came out of the gates firing with a 3-1-1 start to the season, but have stumbled a bit since then. They are 2-3-1 in their last six matches, and currently sit sixth in the East, three points ahead of Philadelphia. They will be looking to bounce back from a 1-0 home defeat at the hands of Columbus, though they may still be without forward Juan Agudelo, who has been out for a few weeks with a hamstring injury. Teal Bunbury and newcomer Cristian Penilla have picked up the slack in Agudelo’s absence, combining for six goals in New England’s last five matches. Penilla also has four assists on the season. This match will continue a home-heavy stretch of the schedule for the Whitecaps: four of their next six matches will be at BC Place. They need to take advantage of this, and something that must improve in order for them to do so is the defence. The ‘Caps are currently conceding 1.85 goals per game, fifth-worst in the league, and this is before Waston flies to Russia. They are not a consistently high-scoring team, so if the ‘Caps remain in the playoff picture it will have to be through defensive improvement.